On the eve of Prime Minister Wickremesinghe’s three-day State visit to Beijing on 6 April as an extension of the goodwill visit made by President Maithripala Sirisena in 2015, this article aims to understand Sino-Sri Lankan relations and the wider relations between China and the Indian Ocean Region in the context of maritime Asia of 2016. In keeping with the purposes and principles of the UN Charter, this geographically-expansive strategy in connecting the industries, peoples and governments to and through China can be summed up as the underlying objective to the One Belt One Road and 21st Century Maritime Silk Road. Policy coordination of stakeholders in the development of unimpeded trade, connectivity of facilities and a top priority placed on mutual co-operation and non-interference in domestic policies are described as the fundamentals on which this grand plan would rest on. 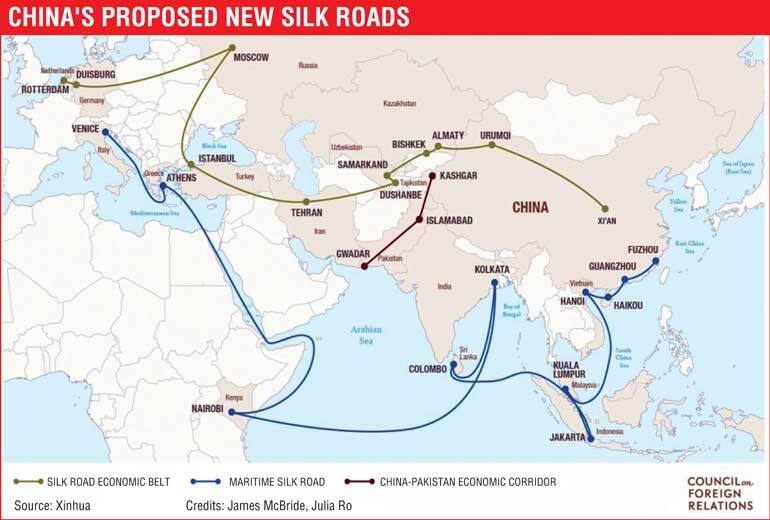 The One Belt One Road and 21st Century Maritime Silk Road are set to connect China through South and Central Asia to Africa and Europe through an expansive road, rail and sea network. In understanding the potential for China and her collaborators on the Belt and Road Initiative, the Belt on road and rail cutting through Central Asia to Europe would provide opportunities for sourcing resources and commodities. The emerging South and Southeast Asian countries along the 21st Century Maritime Silk Road can largely be identified as consumer markets. The emergent Asia in a 2013 study by Ernst & Young is said to account for one quarter of global consumer products market and generate thirty eight percent of global consumer products growth by 2017. Thus, the systematic Belt and Road Initiative seeks to integrate the development strategies of countries along the Belt and Road path. Connecting ports to mainland through road and sea through South, South East and Central Asia from Beijing in the Far East can be described as the signature foreign policy initiative of President Xi Jing Ping. This mammoth relatively all-encompassing foreign policy initiative was originally conceived at the Chinese Commerce Ministry as a solution to handle the problems in sectors of steel manufacturing and paving a way to export to the west of China. This policy gained top level endorsement by President Xi Jing Ping thus being launched as an international aim of Chinese policy in Central and Southeast Asia in 2013. Using the familiar historical metaphor of the ‘Silk Road’, China seeks to forge economic and cultural alliances by the usage of soft power through regions drawn on its map of the 21st Century Maritime Silk Road. Valerie Hansen, Professor of Chinese history at Yale University describes China’s modern foreign policy initiative of the Silk Road nostalgic of its imperial past as “...one of the few terms...that does not involve hard power...and it is precisely those positive associations that the Chinese want to emphasise”. Understanding the New Silk Road in a modern historical context, this foreign policy initiative is possibly set to become the largest exercise of economic diplomacy spearheaded by one nation since the US led Marshall Plan aimed at aiding post World War II reconstruction of Europe covering multiple nations. 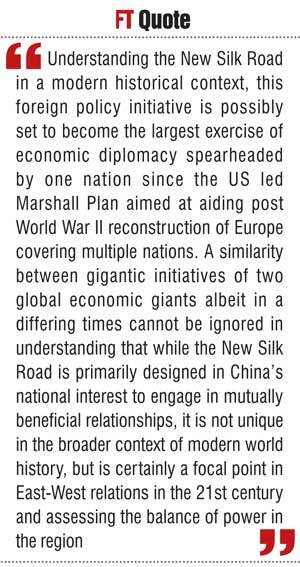 A similarity between gigantic initiatives of two global economic giants albeit in a differing times cannot be ignored in understanding that while the New Silk Road is primarily designed in China’s national interest to engage in mutually beneficial relationships, it is not unique in the broader context of modern world history, but is certainly a focal point in East-West relations in the 21st century and assessing the balance of power in the region. The New Silk Road has led to a complete reconfiguration of China’s relations with its neighbours and re-defining her place in the current global order. While these ‘mutually-beneficial’ plans drawn by Beijing represent a disciplined, consistent and through assertion of the plan from all arms of the Chinese State, it has most certainly entered murky waters in certain neighbouring areas with the local theatre of Sri Lankan shifting foreign policies manifesting through Sri Lanka’s post-election foreign policy rebalancing act being an example. The contentious issues of Port Construction in areas such as Hambantota in Sri Lanka, Gwadar in Pakistan and Lamu in Kenya have led to some analysts questioning China’s ultimate aim. Despite the conflict of interests raised in terms of environment and security, the case of goodwill extended by both Sri Lanka and China even in the face of a domestic regime change in Sri Lanka demonstrates both the mutual interest in maintaining good relations between both nations through time, as has been so through time as described by the Chinese State of Sri Lanka and China being “all weather friends”. Being a port of call to both armed colonisers, royal emissaries, merchant capitalists from both the eastern and western world, historically the strategic location of the Indian Ocean Island of Sri Lanka has shaped its history and island identity. This very same strategic maritime connectivity holds incredible potential in the context of maritime sphere of 2016. Navigating Sri Lanka’s interests and balancing her foreign policy is fundamental in ensuring good relations with neighbours to both her East and West while embracing opportunities to global linkages such as the 21st Century Maritime Silk Road connecting 3 billion people and multiple economies. While being cautiously optimistic about large scale collaborations, as described by Prime Minister Wickremesinghe at the International Maritime Conference , the Galle Dialogue in November 2015, our future is connected to the ocean around us and with it the concept of secure seas engaging with stable maritime management is of the utmost importance while the Indian Ocean Region re-emergence in its prominence in the gaze of global superpowers and a paradigm shift in the balance of sea-power currently takes place. An aspect of economic development as described by Dr. Kelegama which requires attention from authorities and economic policy shapers is addressing the issue of marginal growth in exports from the country as against the steadily increasing import flows into the country. In 2013 Sri Lanka’s percentage on imports to exports to China stood at 1.3% to 16.4%. This gap in one which requires to be addressed to make strategies such as the 21st Century Maritime Silk Road truly economically mutually beneficial to small islands such as Sri Lanka. Culture has become an important pillar within China’s strategy to secure influence internationally as described by Prof. Tim Winter of the Deakin University, Melbourne and has further been laid out at the 2011 plenary session of the 17th Central Committee of the CCP. Economics, diplomacy and culture remain a finely interwoven fabric in shaping global connections. The construct of the Silk Road, One Belt One Road sits on a deep history of cultural entanglements and flows. In a shared maritime heritage none would be as clear a figure as the Ming Admiral Zheng He. His legacy is shared by Sri Lanka, China and multiple 21st Century Maritime Silk Road collaborators as the admiral who led seven fleets across to South Asia, the Arabian Peninsula, and West Africa in the early 15th century. On Cripps Road in the historic port town of Galle remains the site of the archaeological discovery of the famous stone inscription which was carved and brought from China to Sri Lanka. While the accounts of Sri Lanka feature prominently in the official histories of the Ming Dynasty (Ming-Shih) and archaeological histories of Sri Lanka, Sino-Sri Lankan relations have weathered many centuries along the Silk Road of the Sea. A multifaceted relationship, sharing maritime and cultural heritage, strengthening existing trade, economic and diplomatic alliances, balanced and positive Sino-Sri Lanka relations is an important factor in enhancing the potential for collaboration from 2016.